It’s sometimes difficult to understand how a clarinet or saxophone mouthpiece can help or hinder a student’s progress. There are many resources that add unnecessary complexity and cause much frustration as the student tries mouthpiece after mouthpiece with seemingly no end. As many great musicians have learned, it’s important to look for the simple things in the many small tasks that make up instrument performance. Using analogies can help . For this discussion, consider a swimming pool diving board. 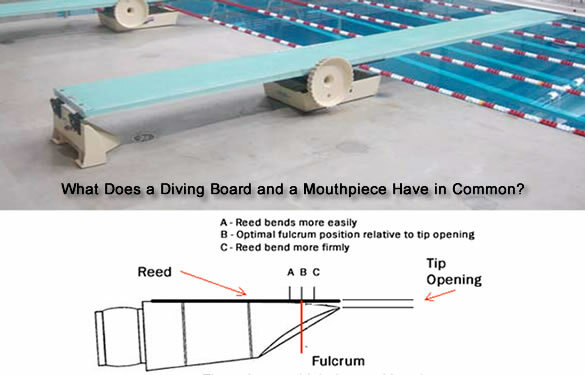 A diving board and a mouthpiece both have a fulcrum that controls flexibility. On a diving board the fulcrum is the roller. The roller can be moved forward or backwards to control the flex of the board. The fulcrum on a mouthpiece facing can be adjusted forward or backwards, as well, to control the flexibility of the reed. When selecting or recommending a mouthpiece, the relationship of the Tip Opening to the fulcrum position and reed strength is very important. The scenarios below are the effects of various fulcrum position, tip opening and reed strength relationships. A. Fulcrum “Back” position – If the fulcrum is in the back position you will achieve more flexibility in the reed. Consider a mouthpiece with a more open tip opening so the reed has room to vibrate. B. Fulcrum in the “Forward” position – If the fulcrum is in the forward position you will achieve less reed flexibility. Consider a mouthpiece with a more close tip opening. In the forward position and closer tip opening a stronger reed is recommended. C. Fulcrum in the “Optimal” position – With the fulcrum in the optimal position and relative to the correct tip opening size the player will achieve maximum reed vibration and airflow through the mouthpiece. So What Should We Tell Our Students? As you consider how best to approach most young students, it’s best to take the middle ground. That means a medium tip opening AND a medium fulcrum position. This combination allows directors to recommend a little stiffer reed to improve sound quality and support for crossing the break on clarinet and support for the low register on saxophone. Embouchure fails quickly and fatigue sets in, and a search for another mouthpiece ensues. Jewel Performance model mouthpieces have medium tip openings and medium fulcrum positions. This allows for suitable reed vibration and proper airflow through the mouthpiece. The results include a better overall use of air, a more consistent and lively tone and greater endurance. Also, the mouthpiece will be suitable for the student for a longer period of time because the proper fulcrum position can handle reeds of various strength. In addition to facing measurements Jewel Performance series mouthpieces are created with a proprietary chamber design and hand adjusted facing for consistent measurements. This is why Jewel Performance mouthpieces are the best choice both for beginning and advancing students. The proper fulcrum position provides for proper reed vibration at any strength and gives the player the best opportunity for a great sound. Recommended by many professional clarinet players and band directors, the Jewel Performance Clarinet series mouthpiece combines affordability with playing ease, flexibility, and rich resonant tones. Each Performance mouthpiece is hand faced, play tested and adjusted for precise measurements and playing response. Each Performance mouthpiece is hand faced, play tested and adjusted for precise measurements and playing response.The reed friendly comfort allows students to hold their embouchures in position longer with less fatigue. Made of Acrylic, the Performance Clarinet mouthpiece is produced in one medium facing. Order Your Samples Today! The Jewel Performance Alto Saxophone series mouthpiece combines affordability with playing ease, flexibility, and rich resonant tones. Made of acrylic, the Performance mouthpiece is hand worked for consistent playing response and sound quality. The reed friendly facing allows students more control in the low register without sacrificing the upper. The Jewel Performance Saxophone mouthpiece is the first choice with many Band Directors as a step-up mouthpiece. Order your samples today!